"September 14-18, 2009 is Book Blogger Appreciation Week! Bloggers will be posting on different themes each day, so check those out and participate if you're into it. I think this week can also be a time when we really show our support for one another. It's the community that makes book blogging so much fun, so have you told a blogger you love him/her this week? If not, this just might be the week to do it. ;) "
People have been encouraging me to get onto Twitter for quite a while. It seems like every week more of Terry Doherty's leads for our shared children's literacy round-ups come from her sources on Twitter. I've seen several interesting posts about Twitter on Greg Pincus's new blog, The Happy Accident, and various updates originally from Twitter on people's Facebook pages. Even my library foundation board is thinking of getting in on the act. My current plan is to use Twitter mostly to collect and disseminate children's literacy and reading news. Obviously, I do a lot of that on my blog already, but I think that there will be value in the immediacy of Twitter. In being able to see a link that's interesting, and share it with people right then, in addition to saving it up for inclusion in a larger round-up. But we'll see how it evolves, or if having one more thing to follow sends me right over the edge, sanity-wise. Meanwhile, you can find me on Twitter (and still on Facebook, where I'm now at www.Facebook.com/Jen.Robinson). Via the Sylvan Dell newsletter, tomorrow (December 18th) has been declared (by someone) Bake Cookies Day. According to the Holiday Insights website, this is a non-denominational holiday in December, one that anyone can observe and enjoy. All you have to do is bake your favorite cookies, alone or with friends or family members. 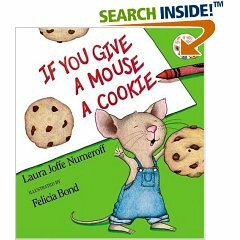 Stock up on butter, sugar, and chocolate now, that's all I have to say... And be sure you have a copy of If You Give a Mouse a Cookie handy, too. Are you in need of some warmth and perspective as Thanksgiving approaches? Head on over to HipWriterMama to read Vivian's post A Thanksgiving Feast of Sorts, and the other posts that she links to. Trust me, it's worth your time, and a fine way to usher in the holiday weekend. I especially enjoyed Christine's post about holiday traditions. As for me, I'm thankful that the Red Sox were able to sign Mike Lowell for three more years. But, on a more serious note, I'm thankful for Mheir, and for our families (although sad that we won't be able to spend Thanksgiving with them), and for the friends with whom we will be spending the holiday, and for the other friends who we love and don't get to see enough. I'm thankful to have a job that challenges me and pays the bills, and to have this blog to feed my soul. I am happy to have found so many kindred spirits in the Kidlitosphere. And I'm more grateful than I can say to those of you who take the time to read my blog, and especially to those of you who are on the front lines, putting books into the hands of kids. "Kim & Jason is all about an idea. It's the crazy notion that there is more to life than the hectic busyness, cynical melancholy and overwhelming stress that is typical of most modern lives. Adultitis tricks us into missing out on the best parts of life and causes us to take ourselves WAY too seriously. We believe that life is meant to be lived to the fullest, that our lives should be bursting with big dreams, oodles of passion, and an enthusiastic playfulness. We believe in curiosity, delighting in the little things, and a faith that knows things always work out for the best. We believe that a life that embraces a childlike spirit is a life that is less stressful and way more fun." 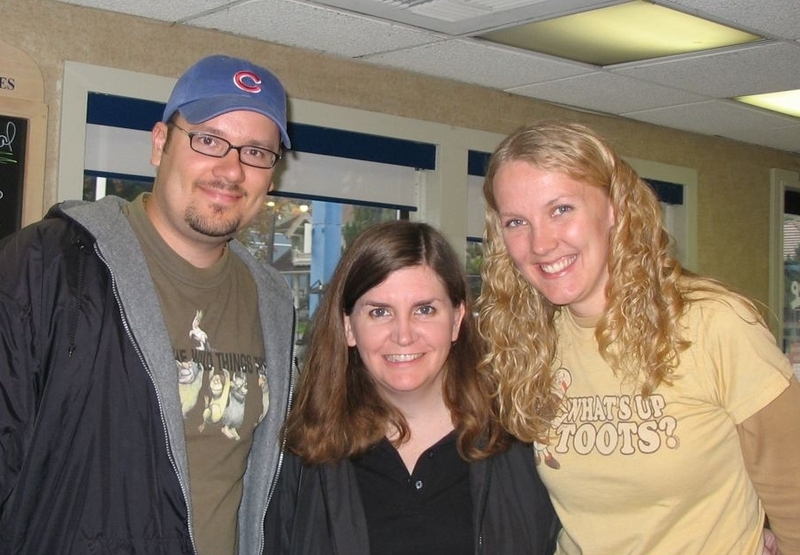 In case you can't read them, Jason's is "Where the Wild Things Are" and Kim's is "What's Up Toots? ", with a picture of a tootsie roll character. My shirt is very boring. Anyway, we had a great breakfast, talking about our blogs and our visions and why we live where we live. I felt like I had known them for years. And I hope to have a chance to chat with them again in the future. It's so nice when you meet people in person for the first time after having email interactions, and they completely meet your expectations. Last Thursday I mentioned the Robert's Snow blog event to fight cancer that's being organized by Jules from Seven Impossible Things Before Breakfast. The idea is that kid lit bloggers will write individual posts about illustrators who are creating custom art snowflakes for the Robert's Snow effort, and use the posts to drive traffic to the auctions for the snowflakes. Today I am so pleased to report (after word from Jules) that the more than 150 illustrators on the original list have already all been snatched up by more than 60 participating blogs. You can find the complete list here. What an amazing testimonial to the power of the Internet, and the strength of the kid lit blogging community. Not to mention the organizational prowess of Jules herself. It's a wonderful thing to be part of. Well, technically I'm not part of it, because I'm not featuring any of the illustrators, but, along with several other blogs (like Read Write Believe; Robin Brande; Journey Woman; JacketFlap; The Reading Tub; Miss Erin; Bottom Shelf Books; Roz Fulcher; Liz In Ink; and Mitali's Fire Escape), I am going to help Jules to promote the event as much as I can. Because I think it's a great thing, and one that deserves lots of attention. You can read more here. Jules and Eisha have started a contest at 7-Imp this week, inspired by questions from Australian illustrator Trudy White. If you answer the following questions, you could (courtesy of Kane/Miller Book Publishers) win a copy of Trudy's book: Could You? Would You? Even though I'm drowning in picture books, I like the questions, so I decided to play. How would someone find you in a crowd? I don't think that I stand out much in a crowed, but I am likely to be wearing a Boston Red Sox shirt. Or maybe a New England Patriots shirt. If your house had a secret room, what would be in there? Books, books, and more books. And a comfortable couch to lie on to read them. Next to the couch would be a big box of Swiss chocolate. And in the corner, a wine refrigerator, filled with excellent red wines. I could hide out in this room for a long time. Where do you like to walk from your house? There's not much of interest within walking distance of my house. Probably the best thing is being able to walk to Blockbuster. How will you change as you grow up? I'll probably continue to become ever more introverted. But I'll get better at knowing what I need to do to protect my recharge time. What sort of animal would you like to be? None. I prefer to stay a person. Even as a kid, being an animal never interested me much. Animals can't read books. If you'd like to play, post your own answers to these questions. And leave a note at 7-Imp. "When it comes to the blogosphere, an Adultitis Antidote is a blog exhibiting a childlike spirit that helps counteract the effects of Adultitis by using honesty, curiosity, passion and playfulness to encourage its readers to delight in the little things, dream big, and stress less." "Not only does she encourage the love of books for kids, but Jen also promotes the continued reading of children’s books by adults!" Which makes this a great time to link back up to my Why You Should Read Children's Books as an Adult. I'm repeating my top 10 reasons here, but there's lots of other background in the original post. Reading children's books as an adult gives you the chance to participate in the amazing kid lit blogosphere (the Kidlitosphere), and discuss books with many wonderful people. Make it Great! | Phil Gerbyshak’s infectious and cheerful mission is to help you unleash the greatness within! Success from the Nest | Tony D. Clark is helping the dreamers out there who are — or want to be — working from home. I've added them both to my blogroll. Wishing you all a weekend filled with childlike joy and wonder. And may Jason and Kim be successful in their quest to make the world a happier place. It's a beautiful day here in Northern California, though the sky is not quite so blue as it was in New York six years ago. I was in Austin, Texas that day. It took me a while to get home, and I had to cancel a planned vacation a few days later. Of course these were very small prices to pay. My brother ended up in Kuwait for a year with the National Guard, but he's home now, too. No direct damage for us, just ... wounds to the spirit. The primary change in my day to day life from 9/11 has been increased security measures when I'm traveling. And this I do not complain about (though I complain about many travel-related things). When the screeners call me aside for an extra check, I say "Thanks! ", and I mean it. They're trying to keep us safe. One thing that I remember about the days after September 11th (besides the searing images), is realizing that in a 48 hour period I had talked to everyone I was close to. How often can you say that? Not often, for me. I live 3000 miles from most of my family and friends. So that was a good thing out of 9/11. And something that I try, not not always successfully, to do better about now. Thanks! I wish you all a peaceful day. Teen suicide is the 3rd leading cause of death among young adults and adolescents 15 to 24 years of age in the U.S., following unintentional injuries and homicide. The CDC's suicide prevention site has lots of additional resources, as does the Young Suicide Prevention Program (YSPP) website. Recommended Reading: It's not out yet, but if you have an advance copy of Jay Asher's book Thirteen Reasons Why (reviewed here), this would be a great week to read it, share it with teens, and/or order a copy for your library. Jay does a wonderful job of addressing a difficult issue, while putting the characters and story ahead of the message. I've had some good feedback to the Self Care for Introverts post that I wrote on Thursday (and which was inspired by a post at Shrinking Violet Promotions), and it's led to some other interesting discussion. Monica Edinger commented with a link to an Atlantic Monthly article by Jonathan Rauch on this same topic. The article was actually new to Shrinking Violet Promotions, and they wrote about it and found a follow-on interview with Jonathan Rauch titled Introverts of the World Unite. The Rauch articles are both excellent - I kept nodding my head as I was reading, and eventually printed them both out to share. I feel like this whole discussion is making clear something that I've struggled with for my whole life. Alkelda from Saints and Spinners also took up this topic and wrote about her own experiences as an introvert who goes in front of audiences to do musical storytelling. She talks about her "camouflage techniques for coping in an extroverted world". Rauch says about introversion: "it's not a choice. It's not a lifestyle. It's an orientation." I find this liberating. And some of you, who love books and particularly enjoy interacting via blogs and the Internet, might find it liberating too. "Honor and celebrate the quiet, low volume, solitary activities that you love and need. They aren't non-activities, and they aren't a sign of your stunted social development." It's funny. I didn't always know that I was an introvert. I put up a good show in high school and college. I was frequently found at parties. In looking back, however, I realize that I have always required my alone time. Not just enjoyed it, but actually needed it. By senior year of college I was desperate to have a single dorm room (and had to jump through quite some hoops to achieve one), even though I was perfectly willing to go out for a little while every night. At some point (I'm pretty sure it was on the Shrinking Violet site, but it could have been somewhere else), I read this definition of introvert and extrovert. You are an extrovert if you gain energy by spending time with other people. You are in introvert if spending time with other people depletes your energy, and you require time to yourself to recharge. This made everything clear to me. I like to spend time with people. Of course I do. But it does drain me, and I need my time alone (or just with Mheir) to restore and repair. And I need my personal quiet low-volume activities, too. The best one is being in a beautiful place, ideally facing an ocean, and reading, with only the sound of the wind and the waves for company. I have only recently realized that whole introvert thing is why I have so much trouble with travel. I just can't summon enough recharge time when I'm on most trips, and after a few days I start to really fray around the edges. I have started trying to build in the recharge time when I'm on business trips. I do things like fly in a bit earlier, so that I have time for a quiet dinner and some reading in my hotel room before bed. And it seems to help. But what helps more is understanding, through the help of people like Robin and Mary, that this is just how I am. I'm working on accepting it, and not beating myself up over it so much. If you need help with the care and feeding of your introvert self, check out Mary's other tips at Shrinking Violet Promotions.